It's really annoying to repeat "/duel id" again an again to duel with the same player. 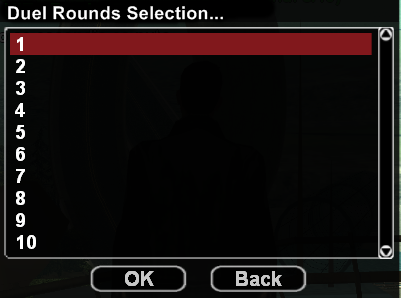 There must be a gamemode to choose how many rounds you wanna play. 1: When we send duel to someone first it will ask you to choose location where you want to duel. 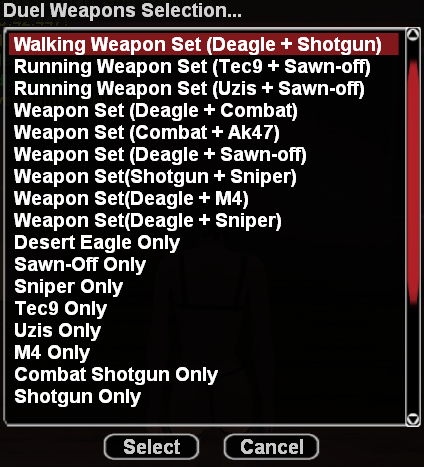 2: Then you have to select weapon. 3: At last you have to choose how many rounds you want to play. It would be great to see this in the future updates. It's already suggested by Next 3 years ago and still not added. Last edited by Teddy; 09-11-18, 08:34 PM. Nice suggestion, i hope that suggestion will be realized and that everything will not be left only on words as the previous suggestion. Last edited by AmazingGuy; 07-11-18, 05:44 PM.